The Golden Gate and strange graffiti? In mid-December, I took a walk through an Arab cemetery right next to the Golden Gate outside the main walls of the old city of Jerusalem. 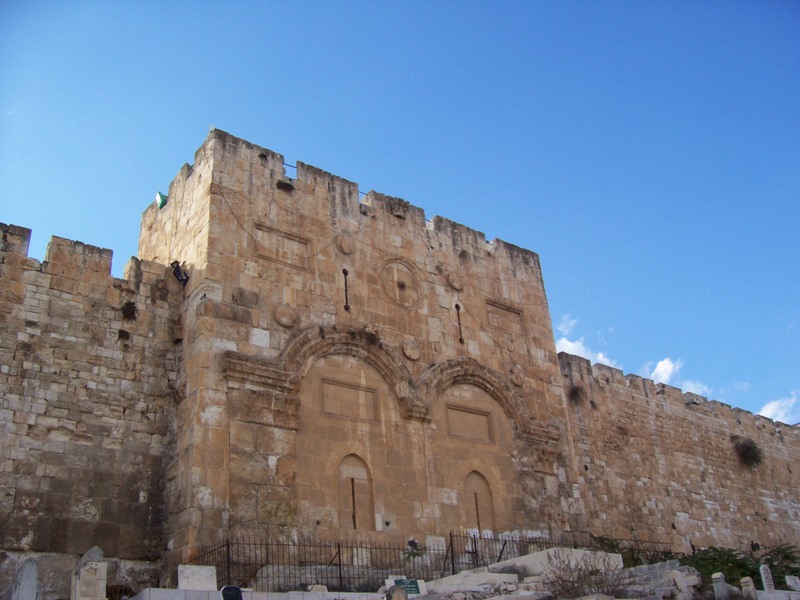 Its one of the oldest of the gates as some special significance as its meant to be where Jesus will go through when he returns to this city. Ezekiel 44 : 1-3 mentions this site. Thinking about it logically, it has been bricked up and a cemetery has been built in front making it unclean from a Jewish law point of view, but this would not stop the Messiah from returning back here. The ground goes up some stepped layers with some trees in front meaning it would not be possible to get a car or horse to go in a straight line from the road from here. I need to go back here and find out what exactly lies on the inside of this gate. You can see the iron railings at the bottom that go around this gate. While I was here there was some graffiti scribbled in some European language on the wall. I took some pictures of it with the intention of doing some research on what it might be, I do not know if its modern or old. Google’s recently improved translator website thought would be good for this, as you can put in some writing of unknown tongue and it takes a guess of what the language is. The top middle part of the text I wrote here. Google tells me this is Finnish, perhaps its just some people’s names but it could not provide me with a translation. If you have sharp eyes and can make out the text better, feel free to comment and have another attempt at what this could be. My photographs of the wall got the suspicion of some Israeli policeman walking across the path, mainly as I was the only the person in the whole ground and they asked to search by rucksack and look at my passport, they then spoke in Hebrew on a radio to headquarters, probably to check the number on my visa was legitimate, they then let me go. This might seem like a nuisance to have to go through to, but its something you get used to and quite necessary in this part of the world. When I was there in ’94, our Jewish tour guide told us someone scrawled in Hebrew the words, “Messiah is coming; Israel is waiting”. We never got close enough to read it for ourselves, however. 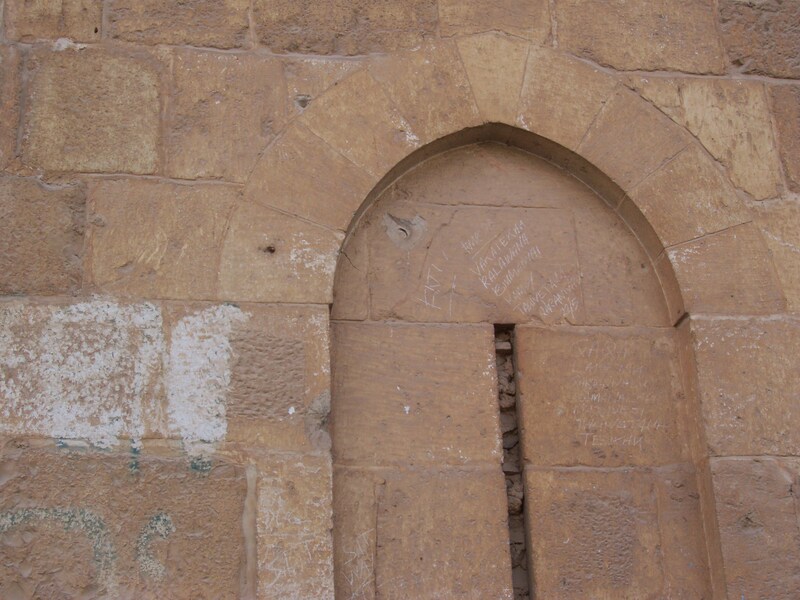 But I do find it amusing that historical Muslim leaders thought that merely walling up the entrance would somehow stop God from entering. I’d love to have been a fly on the wall at THAT meeting. yes, the enemy will cause people who don’t yet know the Messiah to be confused in different ways. 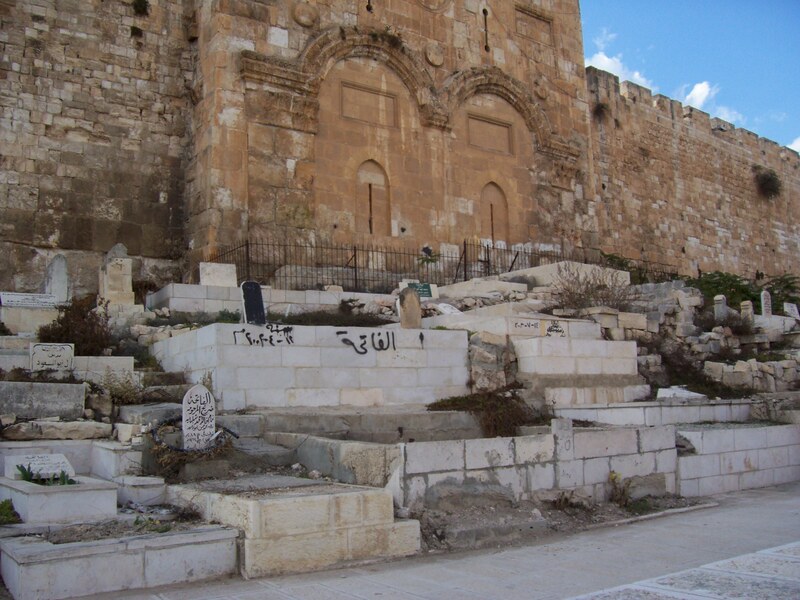 Muslims chose to use this place as a cemetery knowing, that burying the dead make the place “unclean” from a traditional Jewish point of view. Not that will stop the King of Kings though.